Scald soft bones in boiling water. Remove. Place all ingredients into a large pot. Bring to the boil. Reduce heat and simmer 2 hours. Strain stock and cool liquid. Place in fridge for fat to rise and harden. Skim off fat and freeze in 1 litre containers. I did not skim off the fat as my Mum is on a high-calorie, high-fat diet to sustain skin repair. I've also added honey dates and figs as she loves sweet soup. :roll: But the sweeteners are optional. Wash pig tail. Cut into pieces. Scald in boiling water. Drain. Put pork stock and all other ingredients except seasoning into a big pot. Bring to boil. Reduce heat and simmer about 30 minutes till meat is soft. Serve hot with coriander sprigs as garnish. Wow, thanks for posting all these nice soups! Will try the pumpkin soup as soon as i get hold of the ingredients. S_ter, so glad your mum's appetite is improving. But with such nutrition-filled soups, how could she not? Other suggestions: lotus root; white radish & carrot; big onions,tomatoes,celery &carrots. I like to add red dates and kei chi in all of them. 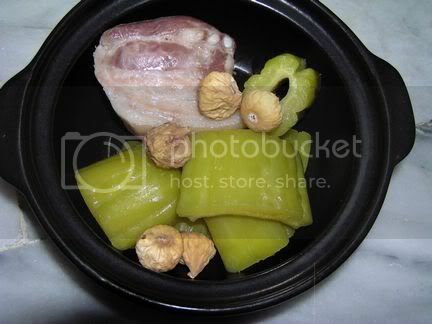 thanks for taking the time to post these mouthwatering soup. Luckily, I have a pot of lotus root and pork rib soup waiting for me when I go home from work today. 1) Red dates & cranberry bean (aka pearl beans). These beans are filling and impart a certain sweetness to the soup. Add them in the last 30 min of boiling, otherwise the beans will become too mushy. 2) Carrot, potato & sweet corn. 4) Duzhong bu yao soup (I get the ready packed herbs from the Chinese Medical shops). This is a little bitter but it's good for health. You may also wish to consider adding peanuts & dried cuttlefish/scallop into your soups. These are supposedly good for "bu qi" (replenish energy). "All our dreams can come true -- if we have the courage to pursue them." Hi folks: Sorry for the tardiness but missed all these postings! amigochen: Pumpkin is in season! Just don't boil them too long or they'll become mushy. PutuPiring: How's the most important member of your family <i.e. your dog > getting along? Love your suggestions re: the soups. Tried a variation of #2 and am poking in the local supermarts for reasonably economical smoked meat! Mum loves the smoky flavour and fragrance! toon: Love your suggestions. Very creative! I love dried cuttlefish/scallops in my soups but I never knew they are good for "bu qi" (replenish energy). My Mum needs plenty of that. Thanks! Hi S-ter, good to see you around. I'm glad your mum is much better and its all due to your good care and love. I had split pea and ham soup today.. You can use smoked ham hocks or smoked turkey legs. Took me 30 mins with pressure cooker. Hope your mum likes it. I used some pot barley , a bit of brown rice, split green pea, split yellow pea, some lentils and some chick peas. good to hear your mom getting better. These soups are so nutritious, a couple of those were my favorite when I still lived with my mom... I miss slurping that pork tail. cwl: Not only is my Mum's appetite improving but her skin is also healing well. Today the staff came and took photographs :roll: Must be doing a before / after advert for the place... but truly, the healing seems miraculous! Giselle, Miss seeing you around lei. Hugs to you! Giselle, Happy Thanksgiving to you and your family too! Hope you're going someplace warm for vacation. thanks to you posting these soup recipes. 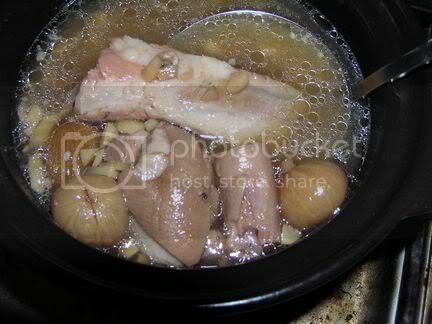 After a decade of not cooking soup, I finally boiled myself some pork bones with kei chi and red dates. It was slurping good. Running out of puff so am sitting on the sidelines and watching all the delicious food go by. cwl: Although Mum did well, skinwise... we found out that she's not cooperating with the physiotherapists... Haizzz... So might get booted out from the rehab programme. Gotta speak with the docs today and see what else to do. Sinner: You running out of puff??? But you'd just consume the puffy chicken feet... Before you know it, you will start another run :lol: Just curious.... did your DH drink the soup with you, or did he :roll: ? ... did your DH drink the soup with you, or did he :roll: ? the pics really make me hungry now..